Figure 1. 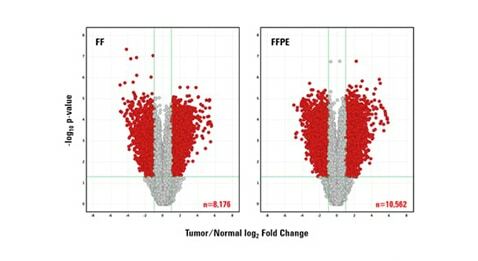 Concordant Tumor/Normal Expression Analysis for FF and FFPE samples. Volcano plot of significant fold-change where red points represent genes with >2-fold-change expression with corrected p-value <0.05. Try the SureSelectXT RNA Direct product today! Figure 2. 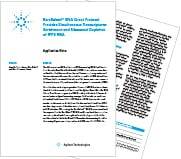 Agilent SureSelectXT RNA Direct Protocol: Simplified RNA-Seq capture protocol that starts with total RNA and incorporates a single hybridization step and on-bead PCR post-capture to maximize the performance of the workflow. To learn more, download this Application Note today! For Resarch Use Only. Not for use in diagnostic procedures.